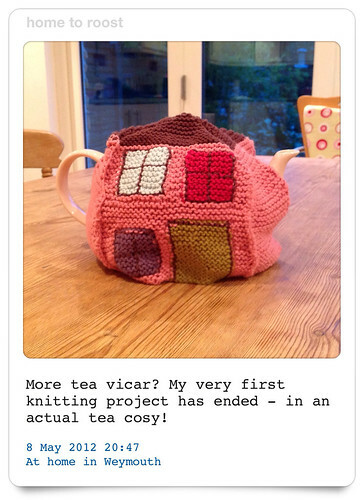 A few weeks ago I started my very first knitting project – a house tea cosy from Kirstie Allsopp’s ‘Handmade Home’ book about trying new crafts. Having never knitted before I didn’t want to start with a square or a scarf, oh no, I decided to launch with a tea cosy, and a tea cosy involving intarsia to boot! I don’t mind telling you that there’s been a fair amount of unravelling as I worked through the instructions (which were pretty easy to follow), but I have made it (literally)! And you can see the result here.